As I said in a recent post, on my recent trip to Katmai National Park and Preserve I really hoped to make some images that featured not only the great grizzly bears, but also the awesome fall colors of the boreal forest . The Black Cottonwoods of the area provide the perfect background for photographing grizzly bears, but rarely do photographers seem to combine the 2. Most folks come up to Alaska and shoot the bears in the summer, and I think they’re missing out. The classic shot of a grizzly bear fishing for salmon at Brooks Falls is nice, and only generally possible mid-summer, of course, but there are a lot of other opportunities around in the fall that can be equally exciting. Great fall colors make stunning backdrops, and can really bring a vibrancy to the image. Stepping back, zooming out, and letting the scene dictate the photos is often the key. In this photo I enjoy the sense of relationship between subject and environment – the dichotomy is largely only a function of our thought processing. The idea that the “environment” is something other than everything is a little peculiar; the subject IS the environment, as equally as the environment is the subject. There is really no difference between the bear and his habitat. The fall color is just one of the reasons to come visit Alaska in the fall; fewer people means fewer photographers, which makes the trip a little more like a real wildlife photography trip and less akin to hordes of paparazzi marching through the woods. I spent a little over 2 weeks photographing the bears of Katmai, and saw not a single other photographer the entire time I was there; a few fishermen were about all. Another great reason for grizzly bear photography in the fall is that the bears looks so much better in the fall than they do in the summer. The bears fill out and fatten up during the summer months, and the difference between a bear in July and the same bear in late September is marked, particularly in a place like Katmai National Park and Preserve. The easy access to such an abundant and rich food source (the enormous runs of Sockeye and Coho salmon) means calories and lots of them. Some of the big male bears, or boars, have been estimated to gain as much as 500 pounds in a few short months; individuals can be almost unrecognizable after a couple of months. The gaunt, lean bears of the summer months become heavy, solid creatures in the fall, reaching their prime just before denning. Their coats thicken up, no longer the shaggy, molting summer coat, but a rich, healthy coat as they ready up for the coming winter months of hibernation. They truly take on the appearance of their status as North America’s most magnificent animal. 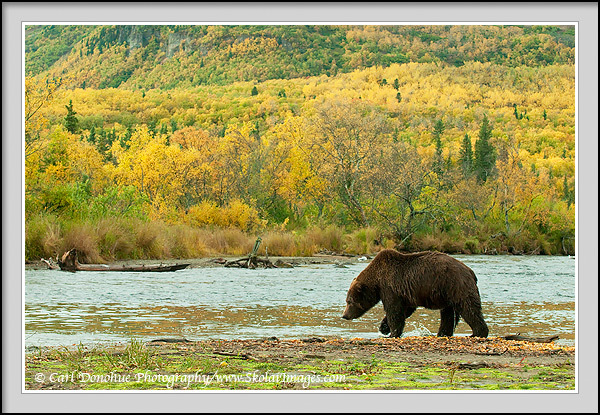 I’ll be looking forward to returning to Katmai National Park and Preserve next fall, late September, to once again photograph the grizzly bears and the great fall colors there. I’ll be leading a small group on a one weeklong photo tour there in 2010, 4 people maximum, and will have more details available soon. Look for a post in the near future with further information; being that it will be a such small group, availability will be tight, so stay in touch – one spot is already gone. This entry was posted in Adventures, Alaska, Fall, Forests, Grizzly Bears, Katmai National Park, Photo Tours, Travel, Wildlife and tagged Brooks River, Brown bears, fishing, Grizzly Bears, Katmai National Park, Katmai National Park and Preserve, mammals, predators, Ursus arctos, Wildlife on November 2, 2009 by Carl D.
You’ve sold me on Fall over Summer. Someday I’ll make it up to Alaska and I think I’ll aim for Fall! Beautiful image by the way. This is downright amazing, Carl. What a magnificent scene and a rare fortune to be in the company of these beautiful animals. This is such a beautiful shot. The fall colors are a great touch and give a really nice contrast to the dark color of this gorgeous bear. It’s a dream of mine to go to Alaska to photograph bears, and you’ve sold me on Fall being a great time to go when I finally get the chance! Thanks all so much for the comments, very kind of you. I’ll plug the fall in Alaska one more time. Don’t let ’em fool you .. it’s awesome! Amazing shot Carl – I only wish we had more colors down around the coastal bays. I much prefer this type of photograph versus one at the falls. Sorry, I missed your comment. Thanks. Yes, it’s nice to try to get something a little different. The color can really make the photos pop.